All are welcome here – all the time. You do not need to be a member of this church or Lutheran to take part in the Sacraments here. We do ask that you desire a relationship with Jesus Christ. His body was given to you. His blood was shed for you. We are a place of welcome and respite. We are also a place where our voices and actions must reflect Jesus’ directives to all of us. We are a work in progress, but we will work to examine our hearts, minds, words and actions so that we can be part of the solution. Verse of the Day – Please join with our congregation in reflecting on the Verse of the Day, provided by BibleGateway.com. Daily Bible Reading – The people of the Evangelical Lutheran Church in America (ELCA) reflect on a Daily Bible Reading. Prayer & Support Requests – If you or someone you know needs prayer or support, consider alerting the Christ Lutheran Prayer Chain. Members commit to pray for your need immediately. You may remain anonymous. To request prayer or pastoral support, please call 847-367-5787 and leave a message or send an email directly to Pastor Amy Becker-Perez (Pastor.Amy.Becker@gmail.com) or to ChristLutheranVH@aol.com. Mid-Service Sunday School are available most Sundays, though we take breaks during school holidays and summer break. Children begin worship in church as a family (service starting at 9:30a). They are all invited to the front for a brief Children’s Message (care givers, please feel free to come up too!). Afterward, any children who want to attend are escorted out for related activities, lessons and fun. Children are escorted back to service in time for Communion/Blessing. Activities are geared for children ages 3 through 5th grade, and are conducted in a multi-age setting. Of course, children are always welcome to stay in worship for the entire service – we are a very child-friendly congregation. If you would like to help teach or learn more, please contact Mir Pawlak (mirwyoming@gmail.com). There are still a few spaces available in Christ Lutheran PreSchool for the 2018/19 school year. More info is available on our PreSchool webpages. Students are generally middle school age when they embark on the Affirmation of Baptism (Confirmation) journey, and in elementary school when they prepare for formal First Communion – however people of all ages are welcome to take part. Sessions are scheduled during the regular school year based on family schedules. Learn more by contacting Pastor Amy Becker-Perez (pastor.amy.becker@gmail.com). We’ll decorate rocks to leave around for unexpected encouragement, as well as for an art installation near the south doors. Watch for details on this crafty project you can do at home or during special events here at church. Talk to Penni Sauer to learn more – penry4@gmail.com! Painting Party planned for Saturday, April 28 POSTPONED due to family funeral. Partners in ministry Love Inc. helps people transition from homelessness to hope. This local organization is always looking for things to help set up new apartments. Think about thinks like can openers, dishes, flatware, towels… Keep this ministry partner in mind when you look through your cabinets or see a great sale. The organization also provides pick-up services for local areas. 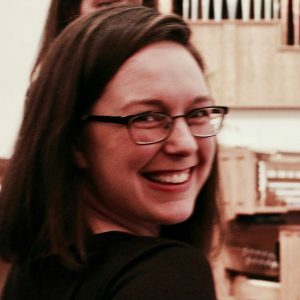 Learn more about volunteering from Natalie (who goes almost every week to work in the Love Inc. warehouse) and Allie (whose heart was touched and who fed us with a wonderful spaghetti meal in support of this ministry). Learn more about Love Inc. at www.loveinclakecty.net. 580 blankets distributed in 2017! More than 350 hat/mitten sets assembled so far this season – already distributed to local schools and shelters! 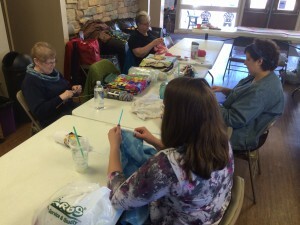 A group of talented and creative participants meet to sew, knit, crotchet and otherwise create blankets, prayer shawls, hats, mittens, scarves and more. 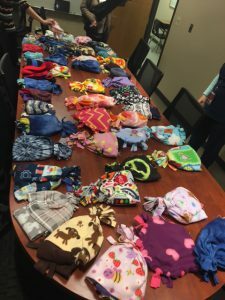 Items are prayed over and provided to those in need of comfort – including people at our local hospitals, and children being served by the Lake County Courts in Waukegan. In 2015, the group completed 590 blankets and 229 hat/mitten sets that were distributed to those in need of comfort and care. What an accomplishment! Everyone is welcome to participate in a work day – no prior experience is necessary. 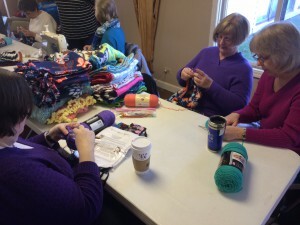 In fact, the group has ideas for comfort craft projects you can do all year on your own – for instance, crocheting prayer shawls or finding good sales on children’s mittens. For information about our work days or how you can help between meetings, please contact caringhandsvernonhills@gmail.com. Our group may be little, but we have huge hearts and helping hands. During the colder months, we especially think about our homeless brothers and sisters. Several members came up with the idea of collecting blankets, sleeping bags and comforters to deliver directly to those on the Chicago streets. We will continue to support those on the streets of Chicago, but we have also expanded to our local veterans groups (including Midwest Veterans Closet), who serve a rather large populate of homeless right here in our midst. To that end, we are gathering adult-size coats, boots, hats, gloves and socks as well as blankets/sleeping bags and small size personal care items, which we will distribute to local groups serving our veterans in need. Please consider looking through your closet and see what you might have that we can repurpose and deliver. Blankets do not have to be in great shape – we clean and mend for them to be used as a base layer on the ground. Ideas for additional items include socks, hats, toothpaste, chapstick and lotion (please, no mouth wash or razors). We also collect winter gear for local children in need. Thank you to Lois Menis for envisioning this outreach, and all who have embraced this important ministry. We support the children in our midst by collecting baby/toddler necessities – diapers, wipes, shampoo, onsies, blankets… Anything helps as the moms we serve through local agencies often have nothing. Throughout the year we will deliver these items to local agencies, including A Safe Place, where they are put to good use. Thank you. COOL Ministries was founded by a group of Lutheran churches in the Waukegan/North Chicago area. (COOL stands for Christian Outreach of Lutherans.) Through this group, we help provide food, clothing, shelter and job training to help lift people out of poverty and into self-sufficiency. Every month we gather offerings of specific items to take to the COOL pantry and programs – or whatever nonperishable you feel called to give – it is all needed! We also donate personal care items, Easter Meals and Thanksgiving Meals. Last year we donated more than 400 pounds of food. Donation baskets are located under the church mailboxes in the hallway. To learn more about COOL, please visit the COOL Ministries website or Facebook page. If you have questions about our efforts here at Christ Lutheran, please contact Rob Jost (rjost@marsinsurance.com) or Penni Sauer (penry4@gmail.com). Thank you for attending the Empty Bowls Soup Supper on November 5. So far, we have raised more than $1000, with every dollar going to the COOL Food Pantry. Donations are still being accepted – and bowls are available for $5 each. Thank you for all of your support, and special thank you to Panera Bread and Jason’s Deli. Hurricanes, Floods, Earthquakes, Fires, Famine – Lutheran Disaster Response is There! Lutheran Disaster Response, part of our parent church, has been hard at work assisting through storms, floods, fires, earthquakes and every other disaster. ELCA Lutheran Disaster Response is one of the most respected relief agencies in the world. They are usually the first one’s in, and are nearly always the last ones to leave – staying to help rebuild when most other volunteers have gone home. You can trust that your donations will go to very good use through this organization. To learn more or donate to this relief effort, please visit the ELCA Hurricane Relief webpages. Collecting and Making Children’s Hats, Mittens, Etc. 390 sets distributed so far this winter to local children in Waukegan and Vernon Hills! Working with our Caring Hands friends, we continue to provide hats, mittens, scarves and gloves local kids who could use some extra warmth. For this winter season, we have already delivered more than 350 sets to at-risk populations in Waukegan and Hawthorn Schools, children served by Lake County Courts, and more. The need is there all winter, so we will gather and distribute again after Christmas. Drop off your donations into the bin under the church mailboxes. Handmade, purchased, fancy, plain – the most important thing is warmth. If you have items for adults, we can distribute those as well through Project Warmth serving the Chicago homeless population. Thank you. Do you have gently used (or new) children’s boots and snow pants you have outgrown? Consider putting them into the collection bin under the mail slots. 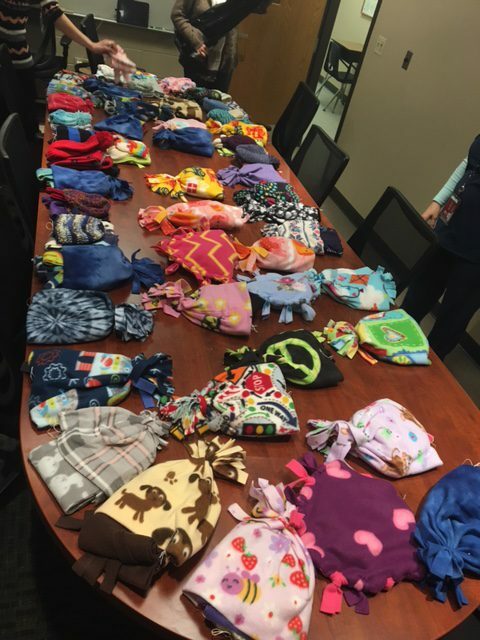 We have lots of young kids (and big kids) who need more warmth this summer. Thank you. The ELCA (Evangelical Lutheran Church in America), of which we are a part, provides one of the world’s most effective and immediate disaster responses. Through this ministry, we provide support to those in need locally and globally. If you are looking for a way to help, consider donating through the ELCA Disaster Response ministry. You will find a “Give Now” button on the right side of the webpage – once you click you will find an online giving form or an address where you can mail your donations. 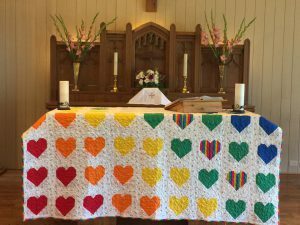 Deb Barnstable has felt moved to create a quilt of comfort to honor the victims of the Pulse Nightclub shooting in Orlando. She incorporated a pocket into the design where we slipped in our notes of encouragement and love. Deb delivered the quilt to the Orlando Quilting Guild, which received more than 2000 quilts and quilt blocks from across the nation and more than 50 countries. 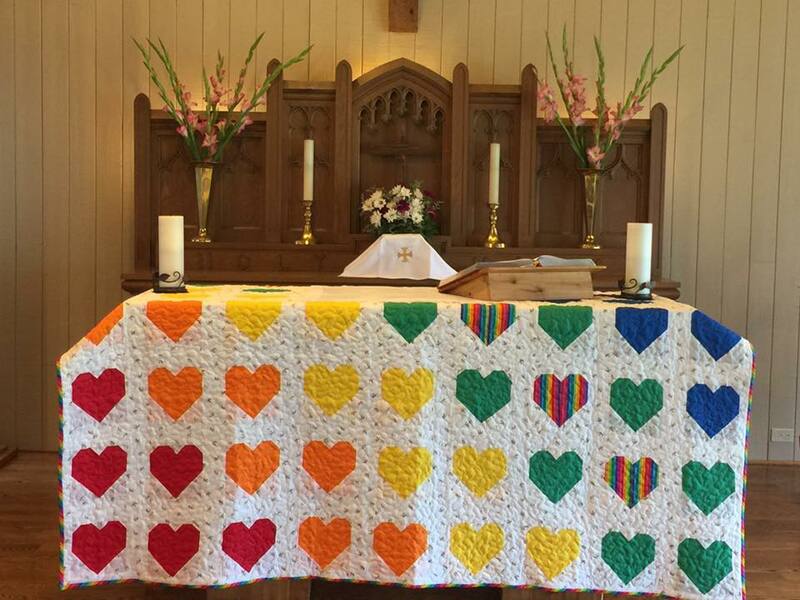 The Guild has more than 2000 quilts to distribute to survivors, the families of victims, first responders, and others who need to feel the warmth of God’s embrace through these lovingly created quilts. Here is a YouTube video of one of the distribution events. (Deb was instrumental in creating the “Jesus the Good Shepherd” art quilt that hangs above the sliding doors.) Thank you, Deb. We are part of the Evangelical Lutheran Church in America, which for decades has been feeding people here at home and around the world through the ELCA World Hunger initiative. As a partner of churches, social ministry organizations and development and advocacy organizations, ELCA World Hunger helps reach communities most in need throughout the world. From health clinics to microloans, food pantries to soup kitchens, advocacy to community organizing, our gifts are supporting innovative solutions that get at the root causes of hunger. Last year, gifts to ELCA World Hunger supported at least 636 projects around the world, including 388 food pantries, homeless shelters and other projects in the United States; and 239 sustainable development, health and other projects around the world . Learn more about our efforts to feed the world on the ELCA’s World Hunger Relief webpages. Christ Lutheran is a sponsoring organization of our local scouts, specifically BSA Troop 273 and Cub Scout Pack 273. Groups meet here at our church from time to time. We as a congregation work to support the boys’ efforts, and in turn the scouts often include us in their projects. Examples of Eagle Projects include new flooring in the PreSchool Work Room, the construction of our utility shed, and landscaping around the building. For more information, visit www.troop273vh.org or www.pack273vh.org. Our church serves as a host site for support groups, including AA, NA and Al-Anon. For more information about the confidential support that is available, please visit the Northern Illinois Area District 10 webpage or the Northern Illinois Al-Anon Family Groups webpage. Make a difference in the world with just a few dollars! What to buy for the person who has everything? How about a pig? Or a malaria net? Or a warm meal? You can give all of these things and 47 more options through the ELCA Good Gifts catalog. This year’s catalog offers easy ways for our families to save coins and dollars toward purchases that make a real difference in the world. (Did you know you can buy 6 large, durable water transport jugs for only $12?) The ELCA (the Evangelical Lutheran Church in America – the group to which our congregation belongs) offers one of the world’s most effective and respected responses to disaster relief and humanitarian aid. If you feel called to this ministry, please check the online Good Gifts catalog. We have gathered some Lenten Devotional resources for use during the Lent. Because we are an Easter People, you may find them helpful any time of the year. If you were living in Europe around this time of year you might see this notation written in chalk above the doorways of Christian homes. The letters are the initials of what tradition says are the names of the Magi: Caspar, Melchior and Balthasar. (It is during this season of Epiphany that we celebrate their arrival.) These letters also abbreviate the Latin phrase Christus mansionem benedicat – May Christ bless the house. The beginning and ending numbers are the year and the crosses represent Christ. Thank you to Tom Pfenning for the information and for changing our sign, especially in this cold weather! Check out more information on German Epiphany traditions, and the C+M+B revival. It is traditional in many churches to use the fall for stewardship drives. In general, those drives would include discussions about church budgets and individual giving pledges. 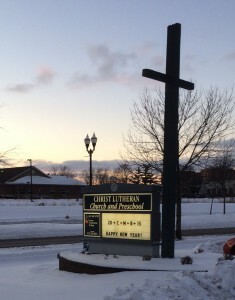 However, Christ Lutheran is a little different (ok – a lot “different”). Instead of talking about stewardship of our building, we talk about stewardship of our faith. You won’t receive a pledge card. Rather, the church works with what we are blessed to receive. As part of that faith, we sometimes focus on our individual faith journeys, and share how as we are blessed so that we then can bless others. Thank you to the four congregation members who volunteered to share their stories during Mission Moments. As a long-time member, Rob Jost talked about what this church means to him and to his family, as well as how the outreach to the COOL Ministries in Waukegan has been a blessing to him just as much as it has been to all those families served. Doug Moore shared just a portion of his life, and the paths upon which God has taken him. One of his encouragements is for each of us to ask God what it is that He wants us to do. Doug is living proof that God will tell you and lead you – be ready, because it will not be a boring ride! Kathy Davis shared how she came to this congregation as she looked for a preschool for Lisa, who is now finishing her college studies. Life has come full circle as Kathy is now our preschool director. Through that ministry we have served hundreds and hundreds of children and their families, helping plant the spirit of Christ in each. Thank you to all who have shared their messages and for all who act as good stewards in so many ways – setting up our Thanksgiving brunch, praying for those in need, teaching our young people, giving a Thanksgiving Meal and so many more ways. Your blessings bless all of us.